This is an example of a 2 stage steam engine like ours. 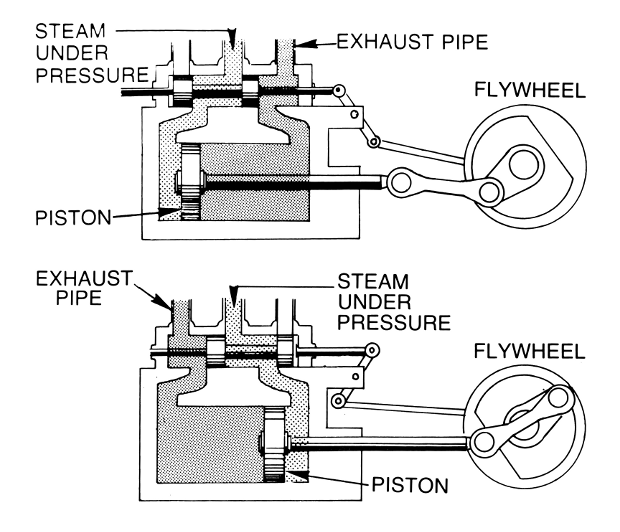 Notice how the piston looks like a pancake and the steam is used to push the piston up (forward) as well as down (back). Some steam engines or more like a combustion energy. The explosion forces the piston down and the momentum returns the piston to the top for another explosion. This works great for a combustion engine but unless the steam engines piston happens to be in the right spot when you open the steam valve, it will only start by you manually rotating the flywheel. 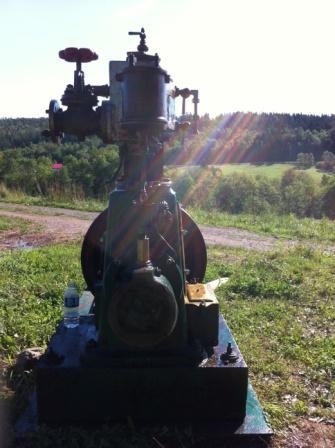 We bought a stream engine in 2011 with the hopes of someday using it as a backup for charging batteries if gas and oil were ever to become in short supply. Our biggest problem has been to find a wood boiler that can produce enough steam to operate the engine for long periods of time. This particular steam engine only needs about 5 psi to operate with plenty of power and speed. But it uses a lot of steam and wood. Water expands 1600 times when it changes to a gas but it also decreases 1600 times when it changes back to a liquid. 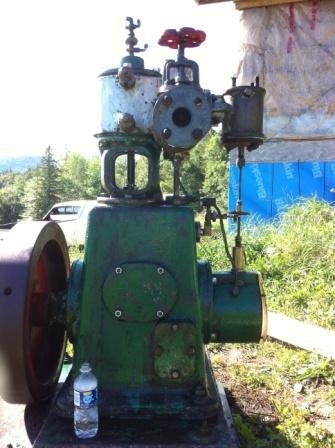 This particular steam engine came off a World War 2 navy ship and was originally attached to a 120 volt DC generator. It was used for lighting the deck of the ship at night and particularly when under attack. It has a built-in governor which is easily adjustable to make constant 120 volts DC. It really is a fine piece of machinery. Click here to see some videos of the steam engine running. Apparently the ship had two identical models in case one unit was to fail they could just turn on the other unit and continue in battle. The navy machine shop could then make whatever part was needed and get things working again. It has an oil sump with a working oil pump. All bearings and journals have high pressure oil pumped into them. When we operate the machine the oil pressure stays pretty constant at 30 psi. Oil sprays everywhere inside the engine. There are little passage ways all the way from the bottom crank bearings all the way to the top valves and valve guides. It is incredible how much better quality this engine is than the engine in my Jeep. This steam was made to not fail even in harsh salt water conditions brought by the Atlantic and Pacific oceans. 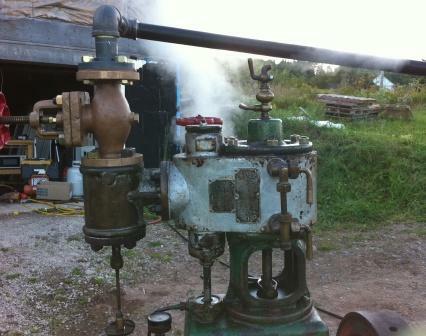 Here is a photo of the steam engine not long after we bought it and before we put any steam through it. You will notice many parts are made from brass. All the valves are made from brass as well as the connecting rods, and even the oil sump cover. The rest is made from very thick cast steel. It is extremely heavy. It is a 2 stage steam engine meaning the piston is like a pancake and has steam pushing from above and below. Many steam engines only have steam pushing from above meaning it will have to be started by putting the steam to it and turning the flywheel by hand. This model starts itself provided there is enough steam to operate it. I will post specs like horsepower, manufacturer and date of manufacture as soon as I can. This is a pic of the steam engine operating with a little steam coming out the exhaust. When you first start it up you need to let the steam run through it for several minutes to get the engine parts heated up. Other wise you have a water engine where the steam condenses before it leaves the steam engine. This robs the engine of horse power and makes a lot of water come out the exhaust. Above is another view of the steam machine with the intake valve removed so I could clean and free up the governor. There are a series of centrifugal weights that fly open at the speed you set. When the weights open they shut the governor valve just enough to regulate the rpm. It is extremely reliable. If you add a load like an ac generator, the governor would have no trouble keeping the speed close enough to keep your generator at 60 hertz (hz). We will definitely attach a Ford alternator to the flywheel via a belt (just as we have with our gas powered battery charger we use now) and use it to charge our 48 volt battery bank. The Ford alternators we use have no voltage regulator and make more voltage and current the faster you turn them. As you as you connect the alternator to a 48 volt battery bank, it becomes a 48 volt battery charger. It is only limited by the amperage it can produce. It is rated at 100 amps meaning it was designed to produce 100 amps at 13.4 volts or 1340 watts or 1.34 kW. However if you attach it to a 48 volt battery bank with no voltage regulator, it can produce 100 amps at 60 volts or 6000 watts or 6.0 kW. There is no harm in doing this other than the bearings will wear out a little faster but seeing as they are 6203 bearings they cost less than a latte at Starbucks. CHECK OUT OUR STEAM ENGINE IN ACTION RIGHT NOW!!! This is amazing! I planning on installing a full off-grid PV system in the 2.5-3kw range running a 48v battery bank and have learned a LOT from all of your articles. Which Ford Alternator are you using? Is there a model or year to choose from? I would be running it into an MPPT at rate also. I have a solar system that has been running out of charge frequently. I have one of those cheap Home Depot generators. Didn’t buy it for this but been trying to use it to charge the solar bank. The solar system has a 4 prong plug. I was wondering if I have to use 220V cord to charge the systems. I’ve been trying it with 110V and it doesn’t seem to charge. So I’m using the 4 prong plug but I only have the 110V power hooked up to it. Any information would be helpful.